U.S. Ambassador calls for inspections of Iranian military bases, says UN forces in Lebanon turn blind eye to Iran’s arming of Hezbollah. U.S. Ambassador to the United Nations Nikki Haley on Friday called for nuclear inspectors to be granted access to Iranian military bases, Reuters reported. She urged the International Atomic Energy Agency (IAEA) to use all its authority to ensure Tehran’s compliance with the nuclear deal it signed with world powers in 2015. “I have good confidence in the IAEA, but they are dealing with a country that has a clear history of lying and pursuing covert nuclear programs,” Haley told a news conference after returning from a trip to Vienna, where the IAEA is based, according to Reuters. ”We are encouraging the IAEA to use all the authorities they have and to pursue every angle possible “to verify compliance with the nuclear deal,” she added. Haley made her comments at the United Nations after returning from the visit to Vienna, where she met with IAEA as part of President Donald Trump’s review of the Iran nuclear deal made by former President Barack Obama. Trump has been a vocal critic of the Iran nuclear deal, describing it as “the worst deal I’ve ever seen negotiated”. While Trump's administration recently confirmed that Iran is adhering to the nuclear agreement it signed with world powers in 2015, Trump and other officials in the administration have stressed that the President still has reservations about the deal. Iranian President Hassan Rouhani, for his part, recently threatened that Iran would walk out on the nuclear deal if the United States continued to apply fresh sanctions. In addition, senior Iranian military officials have rejected the idea that any foreign state, especially the U.S., would be allowed to visit the country's military centers. 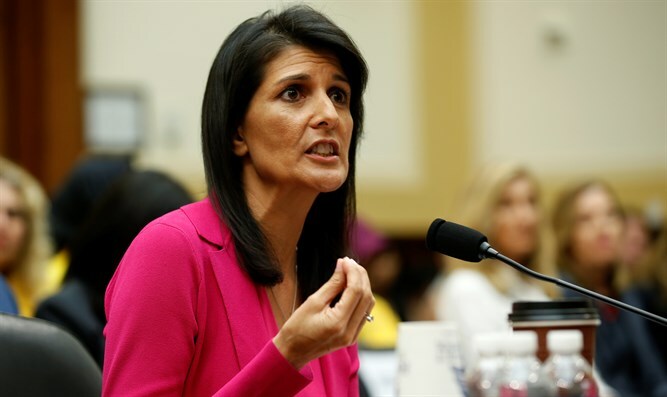 In her comments on Friday, Haley also leveled harsh criticism at Irish Major General Michael Beary, the commander of United Nations forces in Lebanon (UNIFIL), accusing him of turning a blind eye to Iran’s covert arming of the Hezbollah terrorist group. In June, Israel’s UN ambassador Danny Danon presented new information to the Security Council revealing that Hezbollah had established a series of outposts along the border with Israel under the guise of agricultural NGO “Green Without Borders”. The UN, however, rejected Israel’s claims, saying that “Green Without Borders” members have planted trees in the area, but it "has not observed any unauthorized armed persons at the locations or found any basis to report a violation of resolution 1701." “Hezbollah openly brags about their weapons. They parade them before TV cameras. The secretary general’s reports have confirmed this. For the UNIFIL commander to deny it ... has any proof, shows that we need to have changes in UNIFIL,” Haley said in Friday.